CHICOPEE, Mass. 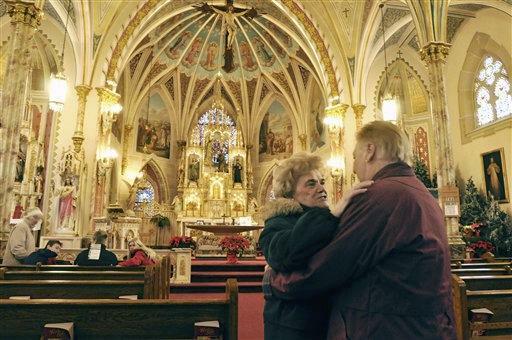 (AP) - The Vatican has ruled that three western Massachusetts churches closed by the Springfield Diocese should reopen, including one that's been occupied in protest for two years, parishioners learned Tuesday. The Vatican's Congregation for the Clergy ruled that Bishop Timothy McDonnell didn't justify closing St. Stanislaus Kostka church in Adams or two Chicopee churches, St. Patrick and St. George. That means the churches will reopen for worship, though it's not clear to what extent they can be used. Laurie Haas, a leader of the vigil at St. Stanislaus Kostka, called the decision "monumental." "Everyone here in Adams is rejoicing and full of joy!" said Haas, whose church has been occupied by parishioners around the clock since December 2008. With similar rulings on churches in the Allentown Diocese in Pennsylvania, the Massachusetts decisions could signal a new Vatican policy that makes it tougher for local bishops to close and sell church buildings, said Peter Borre of the Council of Parishes, a group formed to fight church closings. Keeping churches open, even on a limited basis, is important because it continues the church's vital evangelical mission where it otherwise might be lost, Borre said. "The principal item in the job description of the bishop is the salvation of souls," Borre said. "And you do not achieve that by destroying the presence of the Catholic church in a diocese." The Springfield Diocese can appeal to the Vatican's high court, and it will have much to say about how the three churches should be used - conceivably for occasions as frequent as regular Mass to a more sporadically opened place to pray. "This is not mission accomplished," Borre said. A diocesan spokesman said he wouldn't comment until the Vatican rulings have been closely reviewed. In recent years, Roman Catholic dioceses around the country have closed dozens of parishes, citing falling attendance, a lack of priests and financial strain. In Boston, for instance, five churches have been occupied since a broad reconfiguration began in 2004 and reduced the number of parishes from 357 to 291 today. The Congregation for the Clergy rulings, dated in late January, distinguishes between Roman Catholic parishes - which are territorial entities that include all of the Catholic buildings within them, such as rectories, schools and meeting halls - and the main church building within those parishes. In their appeals, parishioners argued the bishop did not meet the high standard under canon law for shutting down those church buildings and converting them from holy to secular use. The Vatican agreed, saying McDonnell did not provide the "necessary grave motivations" for closing the churches. Borre said similar appeals are pending at the Vatican from other regions, such as in Cleveland and in seven Boston-area churches. At St. Patrick church on Tuesday, the front door was locked, but a side door opened to the brick church's cool, well-kept interior. Scattered signs, including one that read, "Save Saint Patrick's - Save Souls," made pleas for money and support in the fight to keep the parish open. The decision was not a full win in any of the three cases - the Vatican upheld McDonnell's decision to close the larger parishes. St. Patrick parishioner Margaret Page said she's still hoping the entire St. Patrick Parish, which closed in 2009, will one day reopen. But, she added, "I'm very happy we got a positive decision." Rachel Bradford was a lifelong parishioner at St. George before it closed in 2009, and drove to the church for weekly services throughout college, law school and even after she moved to northern Connecticut. Bradford, 28, said though the future of St. George was unclear, she was happy there was one. "It's partial win," she said, "and we'll take it for now."